Hi guys! It's been a while huh? For the longest time, I've been looking for the perfect culottes pants pattern. (They are so in right now, I keep seeing them pop up in my Pinterest feed!) I have already tried several and they are either too wide or too pajama-ish for my liking. The Mary Trousers are perfect! The side and patch pockets add so much to the style - eliminating any pajama-ish feeling. The details in these trousers are impeccable. I did have to shorten the length a bit though - which is necessary thanks to my height. For my version, I used a grey tweed from my stash. I only had 1 yard of this material, so I am so glad I was able to make it fit! For the top, I tried to find the perfect fabric to compliment my Mary Trousers. I chose this white birds on black by Belleboo Designs. What do you think? Overall I am pretty happy with how my outfit turned out. They both fit really well and are a pleasure to sew. Everything came together so nicely and the instructions were clear. I am already looking forward to sew another of these! Hi guys! 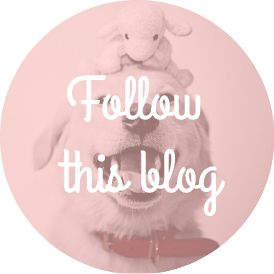 Today i have a free pattern to share with you! I started sewing this shirt way back in 2013 when I couldn't justify paying a couple bucks for a PDF pattern. Ha! I was just getting started into sewing for myself, and didn't want to dish out money for something I might not ever use again.. you know, if I decided sewing wasn't my thang?? haha. Now I own a ton of patterns I have yet to sew!! You can see a sample of the shirt I made here. I wont have the instructions ready for you anytime soon, but I will try! I can't promise. LOL. PLEASE READ BEFORE PRINTING!! Here are some tips to help get you by without the complete/detailed instructions. - I don't have a print scale check box thingy, but please make sure to print at 100% or actual size. - The pattern pieces do not have borders or markers(but i might update it), please try your best to line up the pages and cut the left and top parts equally, use the first page as guide. - Please cut along the outer lines. That is the pattern piece with seam and hem allowance included. - Fold twice 1" for the button placket. - Please use the inner lines as guide as to how your finished garment should look like. - Use bias tape for the arm holes. - Use 6 buttons, and space them equally throughout the button placket. Hello! I just realized this post has been sitting in my drafts since forever! lol. Never got the chance to publish it. Until now. ;) Here we go! I'm a little behind on this, but this dress totally deserves a post!! 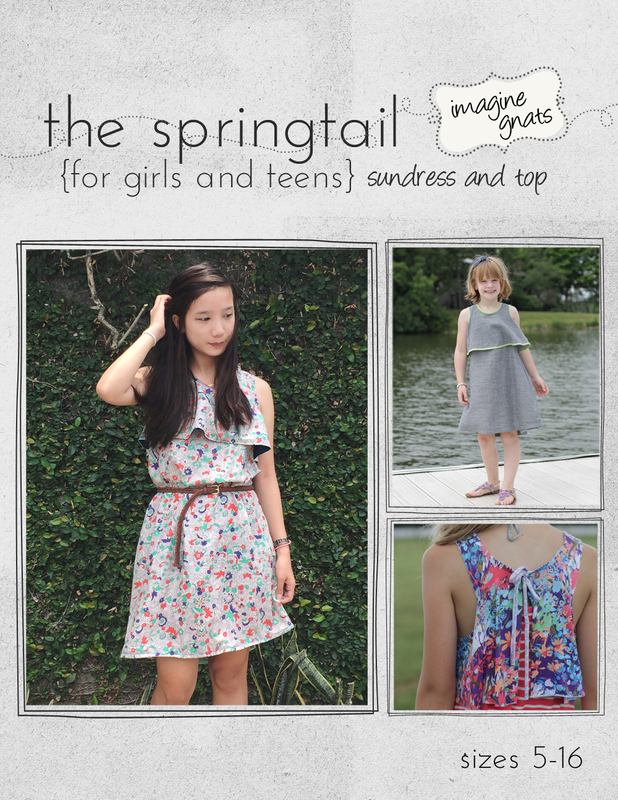 2ish Many many months ago, Rachael from ImagineGnats released her latest pattern, the Springtail Sundress. It's a sweet dress for girls and teens with an a­-line shape, peekaboo back, and bodice ruffle. 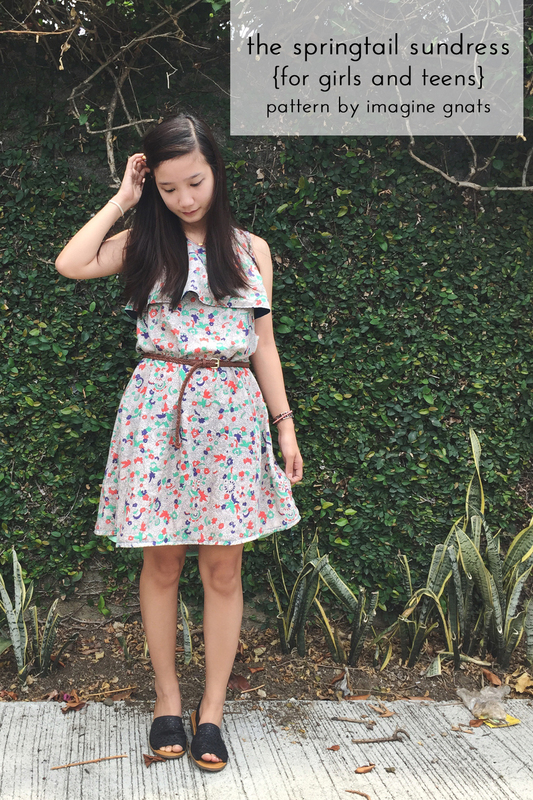 The springtail sundress is easy to wear, fun to sew, and is sure to be a wardrobe staple. This pattern includes multiple finishing options plus both dress and top lengths. Neckline can be bound with strips of knit fabric, fold-over elastic, or you can use a contrasting fabric for a raw edge finish. For the center back closure, you can choose from a button, snap, or tie. The springtail sundress is designed for light - mid-weight knit or woven fabrics with drape, such as chambray, rayon challis, double gauze, or quilting cottons. 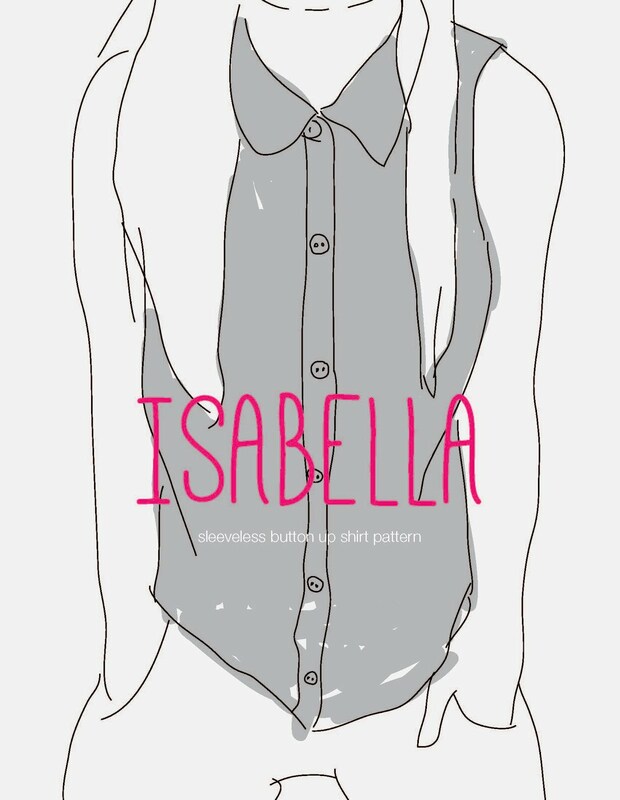 And if you're petit-ish like me, you should really get this pattern and make yourself one! It comes in sizes 5-16 and will probably fit you! I promise, you're going to love it! Look at that cover photo!! If that doesn't convince you, i don't know what else can. ;) haha kidding of course. Head on over to her shop and grab a copy of the pattern! I really had fun testing this dress for Rachael. She is the kindest!! Today is the 6th day of MADEIT Fashion Week, and it's my turn to show you what I've made!! 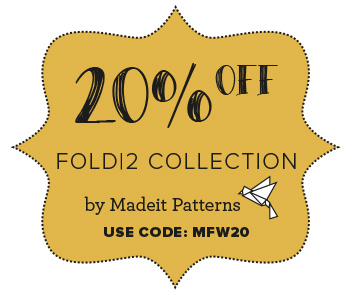 I chose to make the Petal Fold separates, just because! Every pattern in this collection is infused with fine details, that make each piece truly unique! Nothing in this collection will bore you. I promise!!! Hehe. Sorry for the crumply fabric! I didn't have time to iron. But still looks awesome right??? For the photoshoot, we played with water color and lots and lots of paper! Erin had so much fun, all she wanted was to play. I couldn't get decent photos of the garment! lol. But I'm glad i was able to get these sweet photos of Erin and Kurt. I'm regretting that i did not let Kurt show off his Book Fold Trousers in these photos! Go check out the pattern, it's awesome! During fashion week Madeit is offering 20% off the collection, take your change! A little bit of sewing. A little bit of photography. A little bit of life.